For some reason I hesitate to write posts like this. Posts where I tell people what to do. But I have these pictures. And I need a post. And if there is anything that I'm good at, it is putting stuff places. I can arrange furniture like nobody's business. 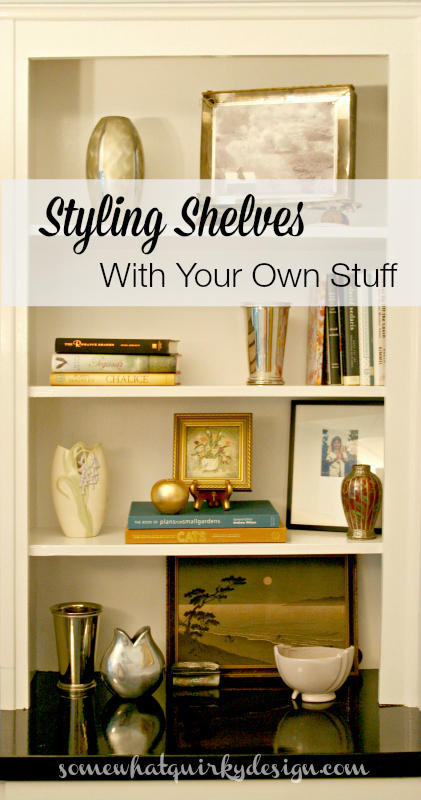 I can style a shelf with the best of them. I'm a picture hanging savant. So I guess you should listen . . . But it's sometimes hard to explain what is in my gut. I'm a fan of the curated. I'm not a fan of the shopped. I like walking into a house, looking around, and thinking "I love this." I don't like walking into a house, looking around, and thinking "this chick knows how to shop." I cannot sit in a room for more than a minute without examining it through my compulsive "I love to arrange stuff" mind. It's not that I'm criticizing anything. It doesn't mean you need to change anything or that the room is awful. It's just what my mind does. My mind wants to arrange your stuff. My friends often ask me to help them arrange their stuff. Which I don't mind doing. But when I do this it is very important that I identify how much input they themselves want in the matter. I don't want to piss them off. Sometimes people ask for your help but that doesn't mean they want to be steamrolled. And by the way . . . sometimes they don't want your help at all. Ask my sister. 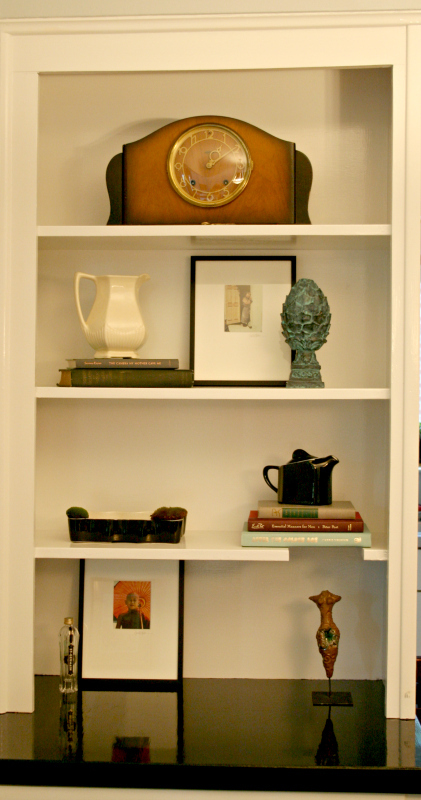 So my friend Jennifer asked me to help her style some shelving that she had in her dining room. Before buffet - that stores much of this stuff now. Before painting gloss white on the cabinets and black on the counter tops. 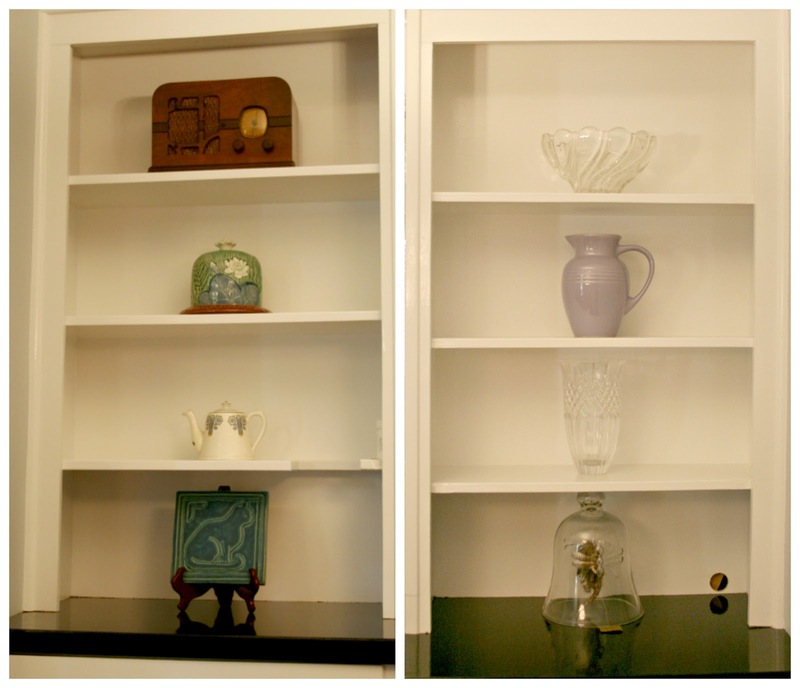 We painted the dining room and shelving and then let the shelves cure for like a month or more. Just long enough that they were screaming "put something on me!!!!" She always has a idea of what she wants. Our styles are seldom the same. Even if they are the same, she wants at least some of it to be her idea. So she showed me some pictures from her Pinterest board to give me an idea of what she liked. So we gathered up some things from the house to get a feel for what that would look like. This can be a good look. With the right items. In the right space. With the right person. I believe this type of arrangement works best with special collections that shout "highlight me." She didn't have 8 items of equal weight and importance to command this space. And truthfully, she doesn't have the discipline to maintain this look. I can relate. So I looked at some more styles that appealed to her. This one was a good place to start. Still slightly minimal but more like her than the first pic. OK. Now we can get down to business. She gathered up a table top of things that she would like to see on the shelves. Then we just played around. Keeping in mind what I think is the most important thing in styling anything - RHYTHM. RHYTHM includes all kinds of things - balance, the rule of thirds, color, symmetry, etc. Note how each shelf has a rhythm as well as the 4 shelves as a whole. Examine this picture (below) for the rule of thirds. 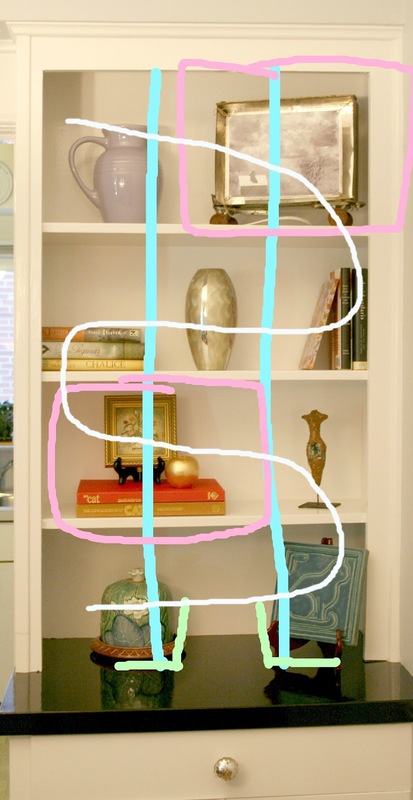 Note how the two pink squares comprise of 2/3 and that the shelf with 2 items has them lined up with the dividing lines. See the "S" rhythm here? Then we refined by trading, adding, and scooting around until everything was most pleasing to her. Note here on shelf #two how the change in the color of books and the holder underneath the small oil painting highlights the picture so much more effectively. Then on shelf 3 adding a dark book to the stack on the left side grounded the shelf. About half-way into the styling of this shelf we decided that once her kittens were grown that the counter here would hold a bar tray. So we didn't worry too much about the bottom two shelves here. Plus - we were tired. See that stonewear pitcher? We both bought one of these at an estate sale. I bought the smaller one and she bought the bigger one. She told me the just the other day, "This pitcher. Every time I see it I'm happy." I said, "That's interesting because every time I see it I wish I had bought the big one and YOU had bought the small one!" The big mistake is on the 2nd shelf. On the left there - that dish was supposed to grow moss. It really doesn't hold it's own in the space. Because you needed to see the top of the item you have to expand the space devoted to it. This might have worked if it was centered between to taller items. Later that week the kittens destroyed it. 1st mistake - never underestimate the capacity for a kitten to destroy something. 2nd mistake - if something needs to be seen from the top to be attractive you should probably display it on a table or definitely a lower shelf. This side has recently had some substitutions that make it much nicer. But of course I don't have pictures. But since we didn't finish the bottom shelf it has become a landing station for all kinds of misc things. That is one of the pitfalls when your shelving doesn't have a definite purpose/use. Ok. This was a lot of nothing. Let me be more concise. Have a clear idea of what you want your selves to look like. 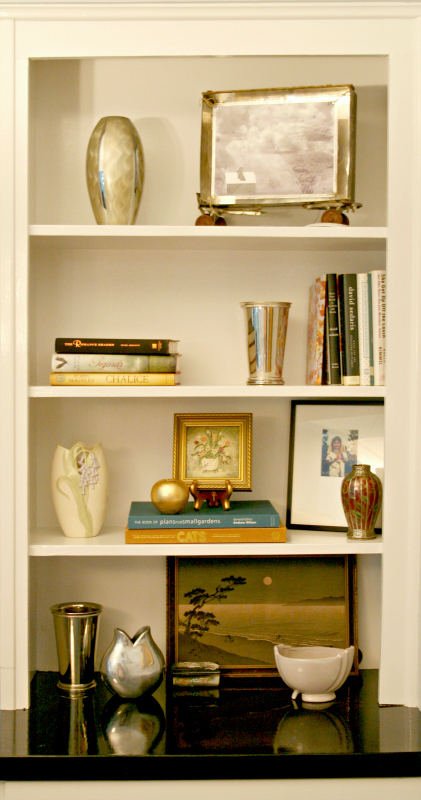 If your shelves have a purpose besides display i.e., books, begin with dedicating 2/3 of the space to the purpose. Put these in first. Start with less. 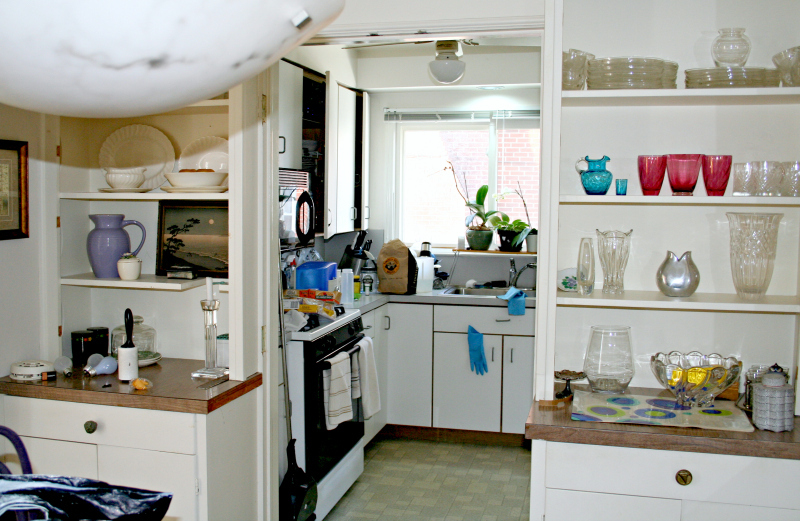 Unless you are a minimalist you will find more things you want to add to the shelf. That's OK. As long as you don't disturb the rhythm. Take the angle you will see the item from into account. 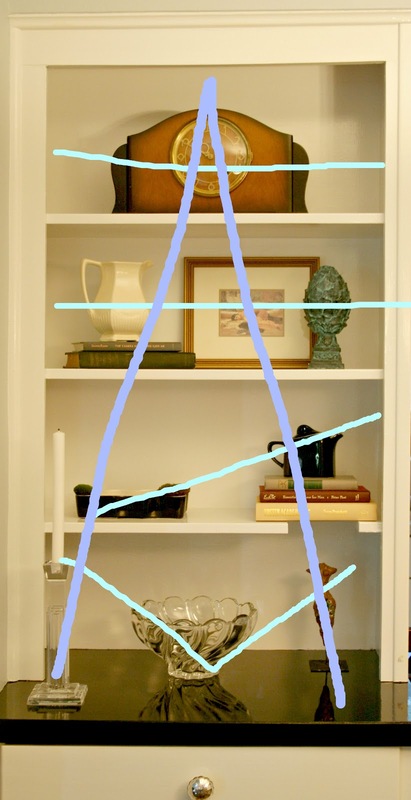 If the shelf is against the side wall of a room you would be more likely to angle the things in the adjacent corner of the shelf. If it is a high shelf you won't be able to see anything up close. Consider the weight. The most weight physically and (usually) visually will look and function best on lower shelves. Put the things you like best where you will see them the most. That's actually my rule for everything in the house. If your needs are storage heavy, keep your storage thematic. For instance baskets. 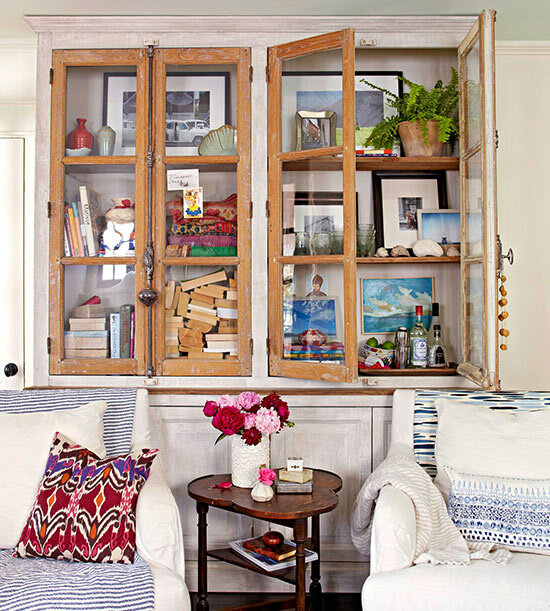 Having all basket storage might work for the more artsy, bohemian approach, but you can take it extreme and have all identically shaped and colored baskets. If at a loss, consult an expert - like Emily Henderson. 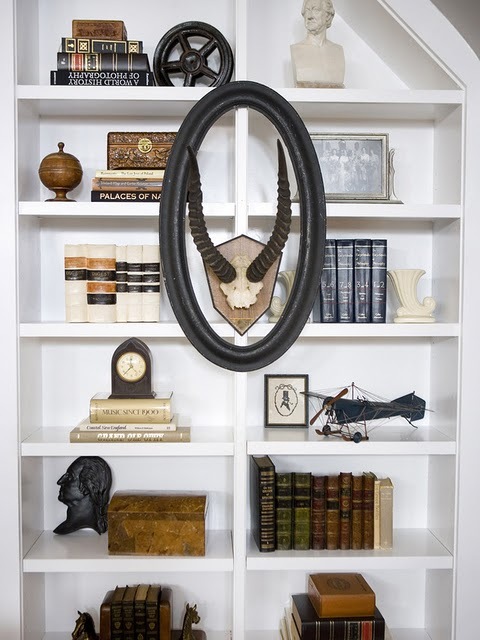 You can see all my shelving thrills on Pinterest. I just looked over the board and it made my heart race. I love me some shelves. Was this helpful or interesting in any way? Should I nix the telling you what to do with stuff? Did you understand what I was trying to say? I personally, 'had it' years ago...but I don't feel so much like I know what I'm doing anymore with my stuff! Could you possibly write a post about that? In terms that I would FULLY UNDERSTAND...and make it easy for me get rid of stuff? I looked at my several of my shelves. I was happy to see that one of mine was right. The other cabinet needs a rearrange. I will definitely use your model and work on it. Thanks so much for sharing. So when are you coming by to stage my shelves? Thanks for the rule of thirds and the S thingy. I take a couple of days to settle into a new shelf design. I create it, sit back, walk around the house, move a few things, get up the next morning knowing what is wrong, move a few more things and by day 3 the shelf is good to go for at least a month. PERFECT, PERFECT, PERFECT. HAVE BEEN LONGING FOR SOMEONE TO 'TELL IT LIKE IT IS'. SO VERY HELPFUL. LOVE YOUR HONESTY AND SKILL. HELPED ME MORE THAN I CAN SAY. MAJOR THANKS. You are a savant of many things! I seem to remember you having some pretty good ideas when you were here in my house too! I'm about to have a whole lot more decorating and styling to do over the next several months, so I'll keep these rules in mind! I love this post! I know the shelves look good and I know we took those steps but WOW! Seeing the why and the steps - just wow! I can't believe that those little changes made it so much better! So, to avoid confusion, the big changes are easy to see, the little changes are the ones that amaze me in how big of an impact they make. Include me in 'all of us non-minimalists'. I think I have some instinct for 'arranging' but it's still fun to read what you write. Speaking of cats, perhaps they can write up their ideas regarding arranging, which is essentially pushing things off edges and watching them fall. Lots of info, good for gleaning... and it really is a preference thing. You've got the eye, and your own process can be hard to explain with something as the thought behind intangible as shelf arranging. A fine post, and good for getting the creative juices flowing! VERY helpful and love your sense of humor!